I got a package of premium smoked bacon from my friend. It's made by a famous smoked meat shop (Mahogany Smoked Meats) in Bishop, CA. 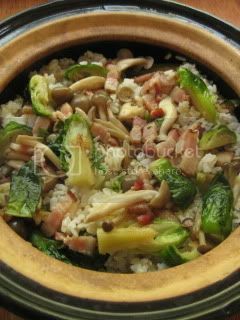 So, I wanted to make something special...donabe rice dish, with the special smoked bacon, and I came up with this unique dish. 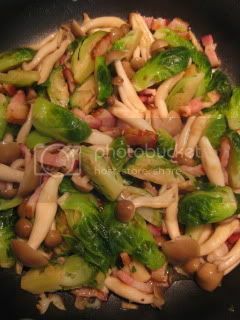 This dish brings out the wonderful aroma and meatiness of the bacon. 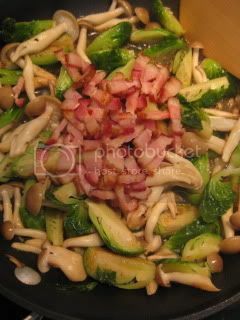 The combination of smoky bacon, garlic, and soy flavors brings out such nice touch to the dish, while the brussels sprouts and shimeji mushrooms add more complex flavors and textures. So, don't forget to add garlic, if you like the flavor. 1. 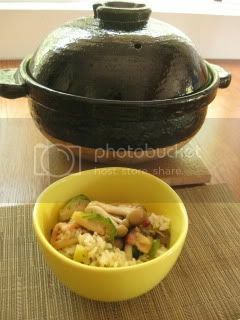 Cook 2 rice-cup short grain rice with double-lid donabe rice cooker, "Kamado-san". 2. 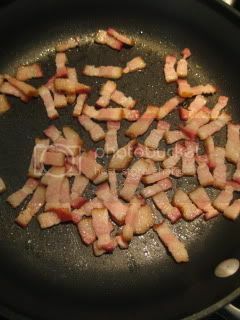 Meanwhile, saute 4 slices of smoked bacon (cut into short strips) until nicely cooked through. Transfer the bacon to a plate with paper towel. Drain excess grease from the pan. 3. 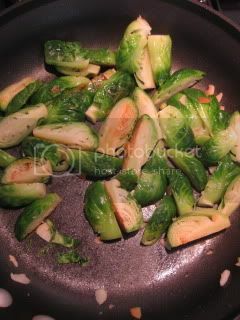 Add a little olive oil and sauté 5-6 oz brussels sprouts (quartered) with a large clove of garlic (thinly-sliced) until the brussels sprouts are lightly browned. Add 2T water and cover. Steam-fry for 3-4 minutes. 4. 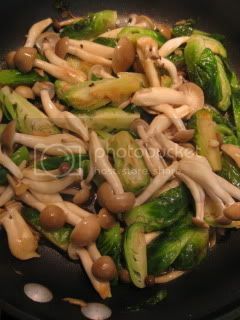 Add 5 oz shimeji mushrooms and continue to sauté. Add 1T each sake and shire shoyu (white soy sauce, or you can substitute with regular soy sauce). Sauté until the liquid is reduced down to almost nothing. 5. Add the cooked bacon and a pinch of black pepper, and stir. Add a pinch of salt, if necessary. Remove from heat. 6. 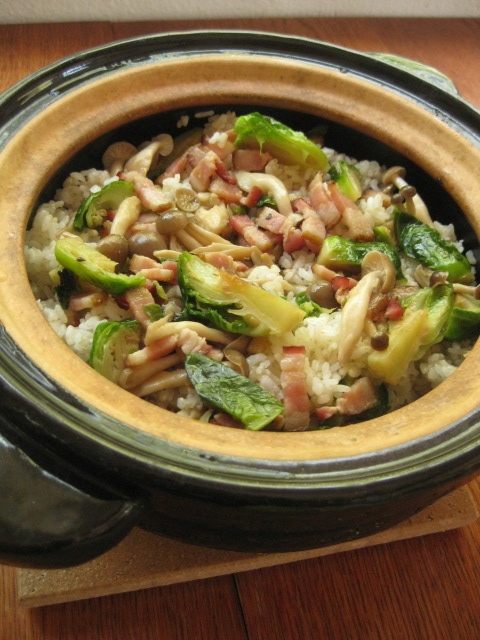 Once the rice is ready, add the sautéed ingredients to the rice and toss gently in the donabe. Serve with lemon wedges. *A little squeeze of lemon gives nice fresh touch to the dish. You can also add condiments such as minced scallion, shredded nori, and/ or yuzu-kosho. Super delicious power donabe lunch.